2016 Tour Season Starts June 4th! Well, it’s that time of the year again when our regular tour season kicks into full gear. As we have in the past we will be open every Saturday and Sunday in June, July, and August for tours. Tours start at 2PM and 3PM. Please note that if there are no guests ready for a tour at 3PM the guides will close up early. It’s been a busy off-season with lots of work to the grounds around the Harker House including the removal of several trees. So much so it is beginning to look a little bare out there! But not to worry new trees will be planted soon forming a border along the west and south ends of the property! Several people have asked about the tall stump that was left by the tree trimmers. 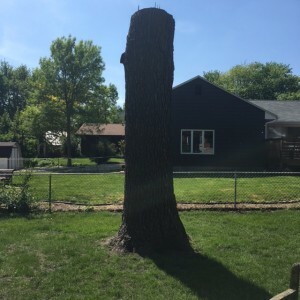 It was left on purpose and local chainsaw artist Jeff Klatt is going to be carving the stump as soon as the weather lets up a little. 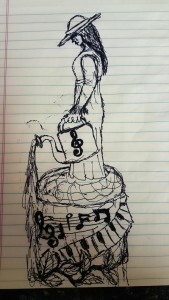 He has done an awesome drawing of a victorian lady watering her flowers with a musical theme. Music and flowers are a wonderful theme of the Harker Family and the ability to represent those interests with this carving will really attract to one of Storm Lake’s oldest homes. Please note that the drawing of the carving is an early sketch, there will be some changes to the final piece. Check out our Facebook page to see progress pictures once the work starts. You can already see that our wonderful volunteer gardener Ann has been busy planting flowers around the house including in our new victorian urn pots. She has also put in some perennials on the west side of the garage. The rose bushes and day lilies have already started blooming! So as you can see lots of stuff happening at the Harker House already this spring and tours will start on Saturday, June 4th. Make sure you make plans to stop by the house this summer and see the inside of the home build in 1874/1875. We did raise the cost of admission this year to $5.00 per person for adults (Children under 18 are free). All the funds raised from admission for tours helps to preserve the history and maintain the house. Do you have friends and family coming to visit this summer? Make plans to bring them to the Harker House! If you have a large group and want to tour the house outside of the normal tour hours you can contact us for a special tour. We are happy to schedule these tours just give us a call! Thanks for visiting our web page and make sure to check us out on Facebook (www.facebook.com/harkerhouse)!